Second Anniversary – In April 2012, we celebrated the Roha organic olive plantation’s second birthday. On Land Day, more than 100 friends of Sindyanna came to Wadi Ara’s fertile lands, Arabs and Jews including Ma’an agricultural workers from the surrounding villages, students, youth for social change, members of Beit Haam from Tel Aviv and more. Everyone pitched in, tilled and weeded the ground, planted and trimmed, and had a great meal after all their hard work. Sindyanna of Galilee promotes Arab agriculture and creates jobs for Arab women – we don’t just talk about it, we do it! Save Oasis, our Arab-Jewish Fair Trade Olive Grove – On May 9, 2014 we held a protest rally at Oasis to prevent the placement of high tension electric cables over our Arab-Jewish organic olive grove in Roha, as well as over other agricultural lands in the area (read more). 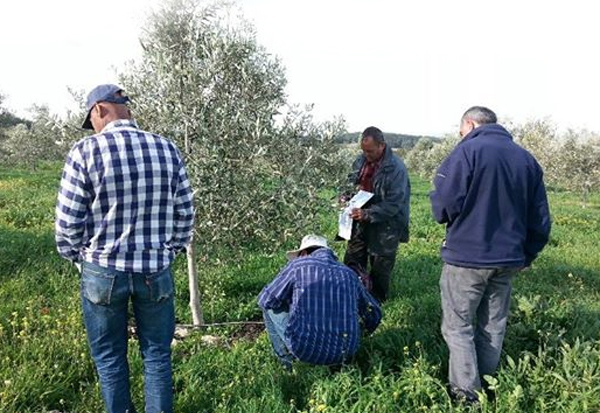 Implementing organic pest control – Dr. Yizhar Tugendhaft, Training Director at the Israel Bio-Organic Agriculture Association (IBOAA), trained our team on organic methods of pest control. Volunteers later helped set up biological control traps for the olive fruit flies that can damage our trees. These traps are completely organic and environmentally friendly and are an excellent substitute for the poisonous insecticide sprays that are typically used in agricultural fields.We also placed cages to host barn owls that can protect our groves from rodents. Olive Harvest 2015 – On Saturday, November 7 2015 Sindyanna held its annual volunteer olive harvest dedicated to promoting Jewish-Arab cooperation. Five years ago, we planted a grove of thousands of olive trees on the Roha land near Arara. The olives have become a source of high-quality organic olive oil, sold around the world as well as at the Sindyanna of Galilee visitors center in Kufr Kana, and in Tel Aviv.